Comfort food on a miserable day | ___is black the new black? After experiencing a 30 degree drop in temperature, I was jonesing for some comfort food. I took some inspiration from my Pinterest recipe board and decided to make “the Hot Brit grilled cheese sandwich.” BTW, add “hot brit” to things you probably shouldn’t Google (at least by itself. Adding “grilled cheese” was much more successful). Very basic recipe from Chow. Bread, some extra sharp cheddar, and some store bought mango chutney. I used two cast iron frying pans. One to fry and one to weight the sandwich down. About 5 minutes total. I’d advise a sharp or extra sharp cheddar as it nicely complements the sweetness of the chutney. 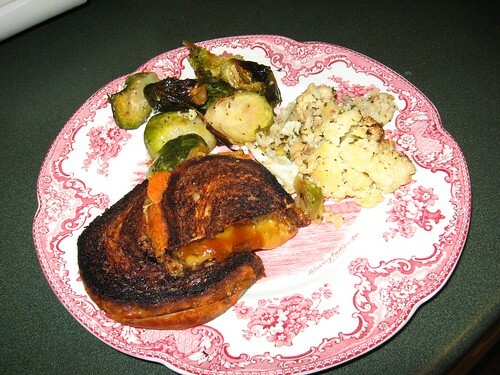 I served it with some roasted brussels sprouts and cauliflower from the hot foods bar at Wegmans. Yummy.